I was up well before the break of dawn driving down Highway 99 and went past the Daffodil Motel at 7909 Pacific Highway (Highway 99) in Milton. So I stopped to take a photo of the terrific vintage sign featuring a daffodil and the promise of free movies. This entry was posted in Hotels, Milton, WA State - King County and tagged Daffodil Motel, free movies, Highway 99, Motel, neon, Pacific Avenue, sign, vintage on January 22, 2017 by admin. 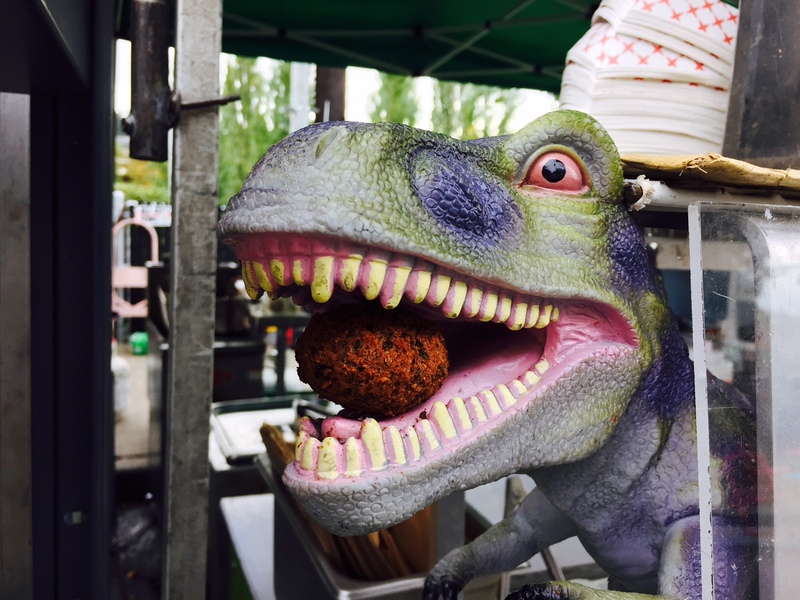 This entry was posted in Seattle, Stores and other places that sell you things, Unique Shopping (stores with some personality), WA State - King County and tagged crafts, Fremont, market, Seattle, Sunday, vintage on October 11, 2015 by admin. 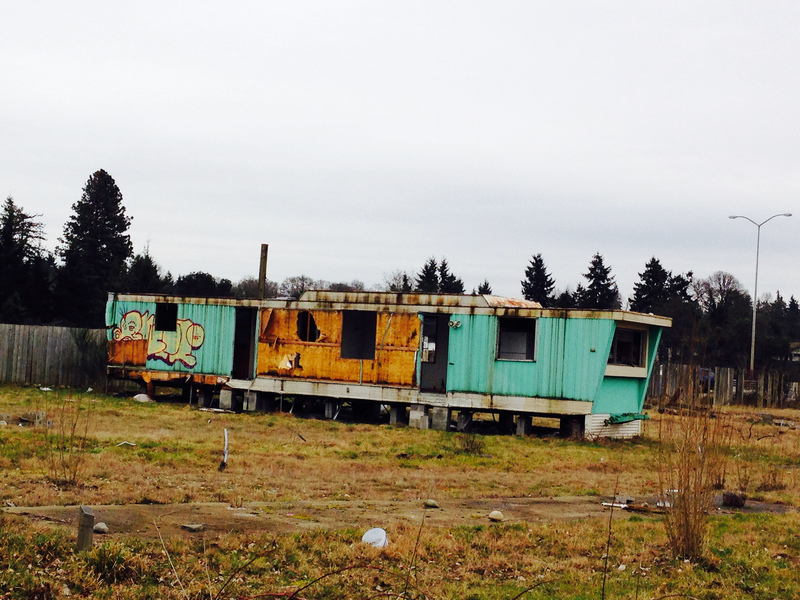 This once splendid trailer is the last man standing in an ex-trailer park north of Highway 512 and East of South Tacoma Way. I could still see the individual pads where the mobile homes once sit and my husband pointed out where each unit’s power was. And there are a couple of rundown buildings that I suspect were the park’s office and perhaps a laundry facility. I wonder why it was deserted and dear husband opined that maybe it was cleared away for redevelopment and then the market collapsed. Perhaps. 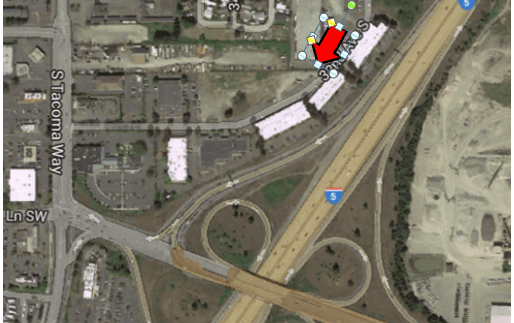 This entry was posted in Residential, Tacoma, Their future is in question, WA State - Pierce County and tagged development, mobile homes, Park, south, Tacoma, trailers, vacant, vintage on March 2, 2014 by admin. 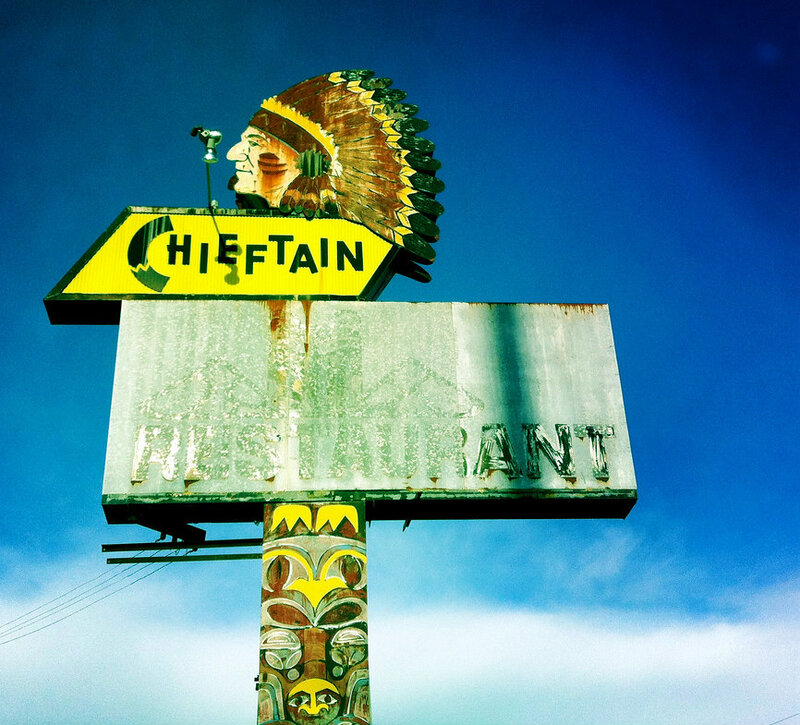 I’ve often admired other folks’ photos of the sign for the Chieftain at 3015 South Tacoma Way and today I stopped to snap one of my own in the chilly March air (really snow called for in March?!). The property was originally Victor Sea Food Products and Victor’s Oyster Bar and George Victor was the builder. It was built in 1946. In 1951 it became Ping’s Garden Chinese Restaurant and in 1953 there was a liquor raid with 41 arrested. 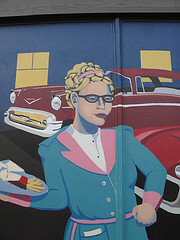 In 1954 it became a Larry’s Drive-In Restaurant. 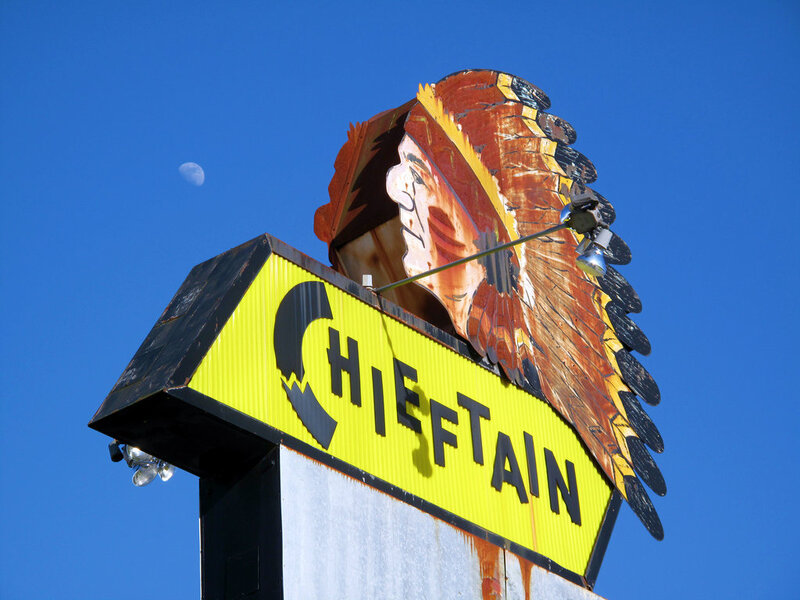 In 1971 it became the Chieftain. 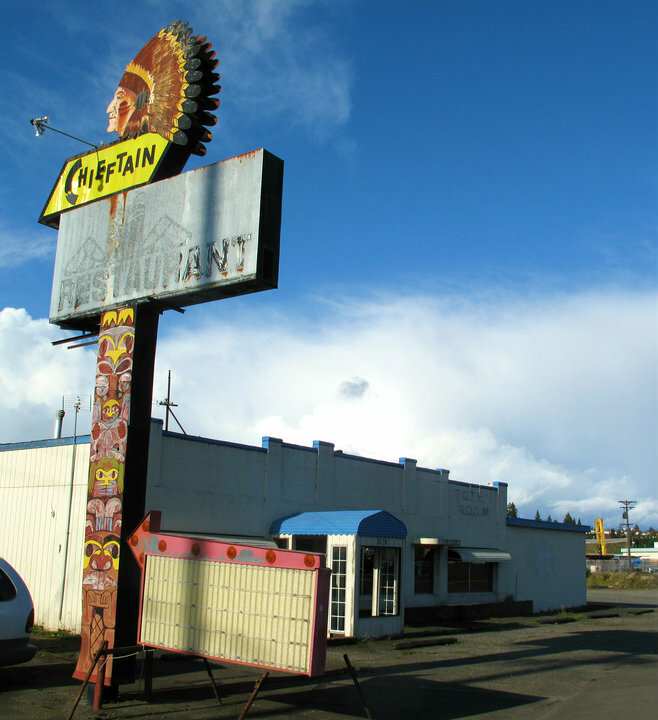 This entry was posted in Restaurants, Tacoma, Their future is in question, WA State - Pierce County and tagged bar, Chieftain, Chieftan, Larry's Drive-In, Ping's Garden Chinese, restaurant, sign, Victor Sea Food, vintage on March 21, 2013 by admin. As you can see from the photos the vintage trailers are darling and lovingly decorated. Bare in mind that these are little spaces which usually have a bed, table, stove, fridge and some storage. Because of the size, they are difficult to capture in a photo, but the website has more photos and there are a couple of books available. The women are really nice also! Cabela’s is the world’s foremost outfitter (that’s their tag line!) 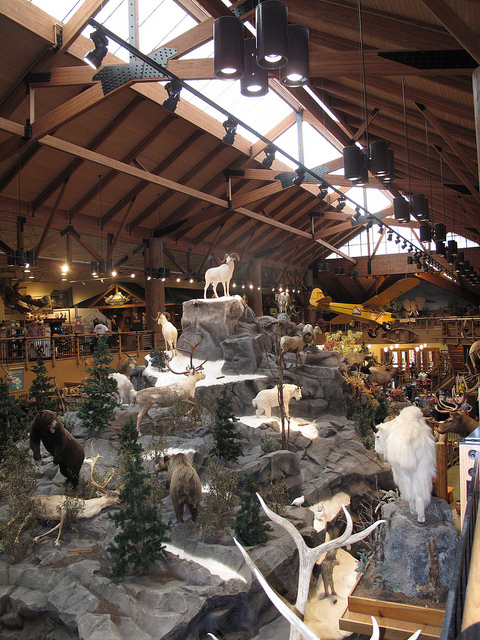 and it is indeed a huge store with a large display of animals arrange in a nature setting. There is also a piper cub plane hanging from the ceiling. Besides an abundance of merchandise, there is a gun library and a restaurant. It reminds me of REI, but with more of an emphasis on hunting/fishing. 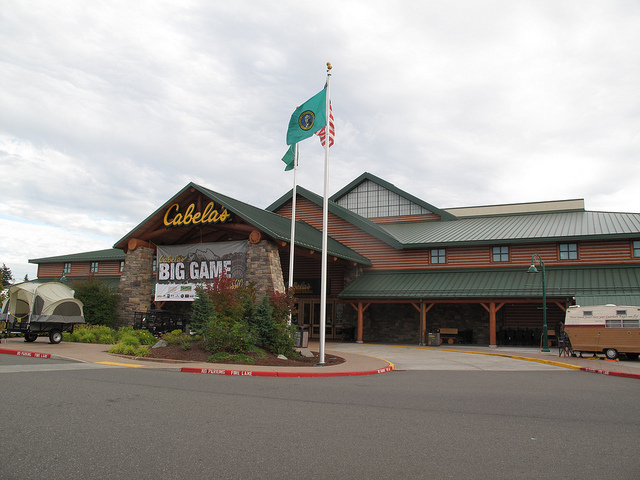 There are 39 Cabela’s with more being planned. This entry was posted in Lacey, Stores and other places that sell you things, The Great Outdoors and Sports, Travel, Unique Shopping (stores with some personality), WA State - Thurston County and tagged adventure, animals, Cabelas, camping, campters, empowerment, fishing, flyfishing, hunting, Lacey, outdoors, outfitter, sisterhood, Sisters on the Fly, small, supplies, trailers, travel, vintage on August 28, 2012 by admin. 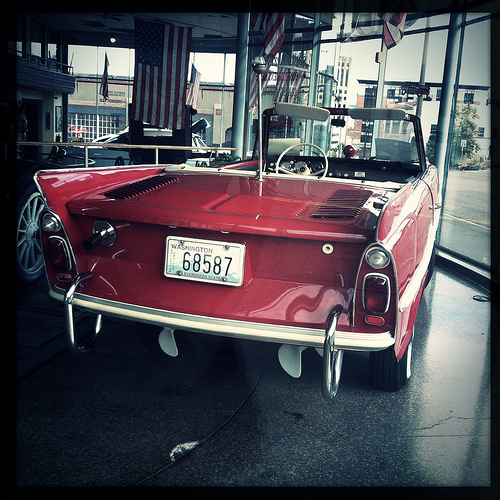 This car on display at USA of Yesterday Motors at 455 St. Helens, Tacoma, is one of 500 remaining Amphicars left in existence. The informational sign said that these amphibious cars are capable of crossing between England and France! The USA of Yesterday building was constructed in 1948 and contains 61,000 square feet of space. It was originally known as the Mueller-Harkins Motor Co. Building and Silas E. Nelsen was the architect. It was a Buick Dealership. It is now U.S.A. of Yesterday Motor Car Co. (see the link below) and besides showroom space has a large banquet room in the style of the 1950s. In 2007 there was talk of demolishing the property to make way for a downtown grocery store, but that didn’t happen. 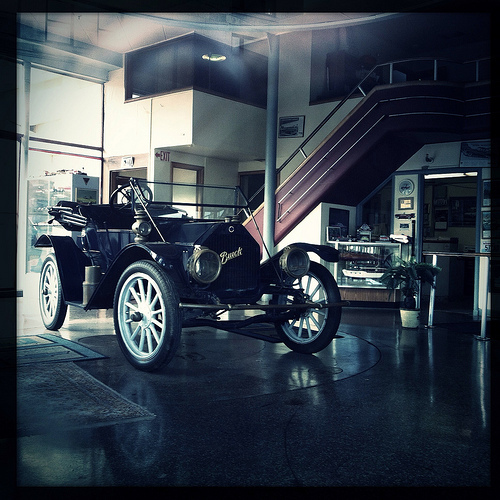 1912 Buick in the showroom. This entry was posted in Stores and other places that sell you things, Tacoma, Unique Shopping (stores with some personality), WA State - Pierce County and tagged art moderne, automobiles, autos, cars, old, Sharp & Sons USA of Yesterday Motors, Tacoma, vintage on August 22, 2012 by admin. 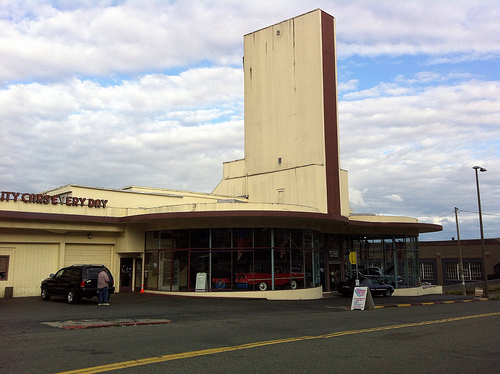 The Past Along South Tacoma Way a photo by Gexydaf on Flickr. South Tacoma Way has some spiffy public art. 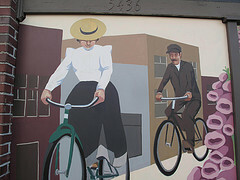 Today I stopped to admire this mural located at 5438 South Tacoma Way which features scenes from the strips past and present. 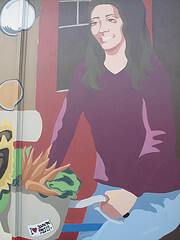 The mural is on the Heritage Bank Building. Although that is the name of building, it is vacant with Heritage Bank is down the street at 5448 South Tacoma Avenue. 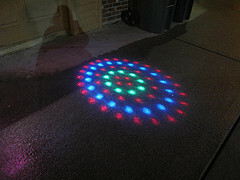 To see more photographs of the property both before and after the mural, go here. 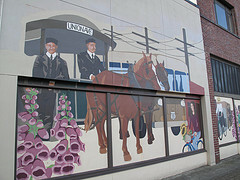 This entry was posted in Art -- there is art here!, Tacoma, WA State - Pierce County and tagged art, bikes, car, Culture, Heritage Bank Building, horse, mural, South Tacoma Way, Tacoma, vintage on March 19, 2011 by admin. 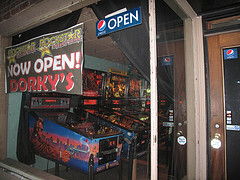 Dorky’s is one of the newer businesses in downtown Tacoma. It is a multilevel arcade that as of tomorrow will offer food and in the future will have a liquor license. For a couple of dollars, you can have a lot of entertainment with machines like Ms. PacMan, Frogger and Asteroids. 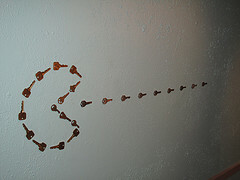 I love the PacMan on the wall that they made out of keys! 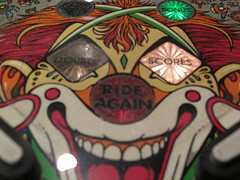 This entry was posted in Art -- there is art here!, Coffee Shops, cafes and bistros, Over 21, Tacoma, Unique Shopping (stores with some personality), WA State - Pierce County and tagged 80s, 90s, Asteroids, Classics, Dorky's, downtown, Frogger, machines, Ms. PacMan, old school, Pacific Avenue, Pinball, Tacoma, video, vintage, WA on January 18, 2011 by admin. Today’s New Place of the Day is the Speakeasy Arts Cooperative’s Gritty City Gift Fair. The fair was larger than I thought it would be and filled with quality crafts and art. I picked up a couple of holiday gifts and a Tacoma — Love it or Leave it t-shirt for myself. 🙂 The co-op is located in a historic building at 746 Broadway, in the Antique Row area. 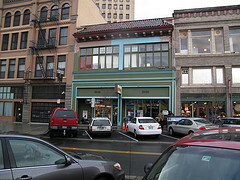 Information from the Tacoma Public Library indicates that the building was constructed in the 1920s and has been used as a Used Car Department, Huletz Electric Co., Preservation Paint, Alma Ayres Women’s Wear, Washington State Liquor Store, and Time Machine Antiques. This entry was posted in Art -- there is art here!, Historic Sites, Once in a while events, Tacoma, The Holidays, WA State - Pierce County and tagged Antique Row, art, arts, Broadway, co-op, cooperative, crafts, historic, Speakeasy Arts, Tacoma, Tacoma Public Library, vintage on November 26, 2010 by admin. I hadn’t realized that it is on the historic register. Here is a News Tribune article on that process. This entry was posted in Coffee Shops, cafes and bistros, Historic Sites, Tacoma, Take Out, WA State - Pierce County and tagged classic, Frisko Freeze, historic register, ice cream, milk shake, Tacoma, treats, vintage on September 5, 2010 by admin.